2nd (Airbourne) Battalion Oxfordshire & Buckinghamshire Light Infantry. Born: 14th March 1924. Stoke-on-Trent, Staffordshire. Father: William Cliffe, Mapperley, Derbyshire. Mother: Annie (Dale) Cliffe, Mapperley, Derbyshire. Note: Additional information given about his family. Stepson of Ernest Albert Moorhouse of Grouville, Jersey, Channel Islands. Memorial: Buried Vauville Churchyard, Calvados, France. (Normandy Churchyard). King’s Shropshire Light Infantry. Private 14690054. Born: 21st July 1925 Mapperley, Derbyshire. Son of Ernest Martin and Betsy (Brown), Mapperley, Derbyshire. Memorial: Buried. Becklingen War Cemetery, Lower Saxony, (Niedersachsen), Germany. Plot 4. F. 6. 1/5th Battalion Sherwood Foresters (Notts and Derby). Private 4978644. Died: Japanese Prisoner of War. Son of John and Hannah Bridges, Mapperley, Derbyshire. Commemorated: On the Singapore War Memorial, Roll of Honour. 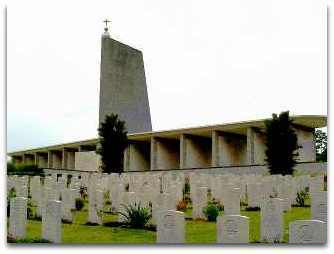 (Which stands in Kranj War Cemetery . Reads: Private Thomas Ernest Bridges 4978644 on Column 71. (Sherwood Foresters Panels (69 – 72 Inclusive). Early 1944 saw the movement of over 7,000 British and Australian P.O.W’s being route marched through Thailand. Men that were suffering from injuries caused by starvation and brutal treatment handed out by the Japanese. Soldiers who were suffering from Malaria, Dysentery and other tropical illnesses were forced to walk with little food or water. By March 1944 they had reached Tha Maa Kham (Tamarkan) prisoner of war camp. On reaching the camp the men were informed that the fittest prisoners would be shipped to Nippon (Japan). Twelve hundred men were chosen, organised into groups of 200 prisoners. These privileged!! soldiers were to face a rail journey to Bangkok and Phnom Penh followed by a boat journey along the Mekong River to Saigon (French Indo China). A camp was set up in an old abandoned French Foreign Legion Barracks. Here they remained for several months in appalling conditions, hoping to hear news of the outside world. News had reached the men that the American submarine fleet had been active in the area. The next move was to Singapore, being again imprisoned until June, facing further appalling conditions and brutality. On 4th September 1944 the men were paraded and informed that all the men would soon “Be going to Nippon”. Following this announcement, they were taken to be loaded onto two ships. The freighters were the Rakuyo Maru and the Kachidoki Maru. Both boats were being loaded with a cargo of blocks of raw rubber. Seeing the ships they were horrified to find they did not carry Red Cross Markings. Which would have indicated that they were transporting P.O.W’s. The men protested. All to no avail. Being forced under a shower of brutality to board the ships. 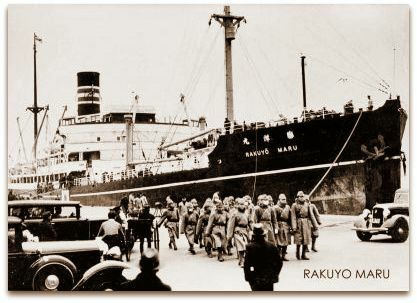 700 Australian and 600 British troops boarded the Rakuyo Maru. 900 British servicemen boarded the Kachidoki Maru. All forced into the bowels of the boats along with the cargo of rubber. These were just a few of the many thousands of men that had started on the march through Thailand nine months previously. Crammed solid the ships set sail for Japan. On September 12th at 5-22a.m. the Rakuyo Maru was torpedoed by the USS Sealion II. 3 torpedoes were fired into the boat. 541 Australian Casualties drowned on the Rakuyo Maru 12th – 18th September 1944. 475 British Casualties drowned on the Rakuyo Maru 12th – 18th September 1944. 12th September 1944, Aged 25. Son of John and Hannah Bridges of Mapperley, Derbyshire. 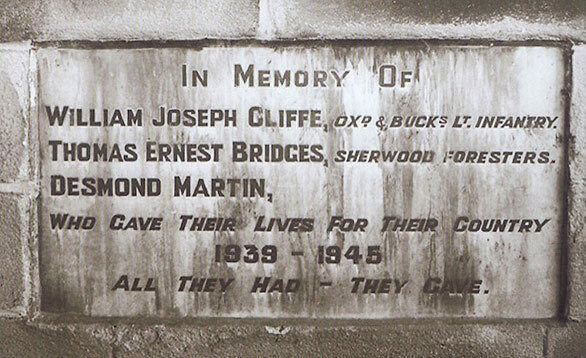 Also remembered on the Mapperley village Derbyshire Lych Gate.